The world’s scientists agree that the evidence of a warming world is “unequivocal.” What is the evidence that provides such certainty? How does the current warming period compare to other times in Earth's history? What will the climate look like in the future? What are the consequences for life that impact health, food, water and the general well-being of the planet? Scientists at NASA’s Goddard Institute for Space Studies (GISS) and Columbia University’s Earth Institute work to answer these questions - studying the vital signs of Earth’s climate, advancing understanding of how Earth’s climate works, offering scientific assessments of climate change solutions and predicting future climate change. 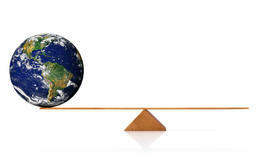 Earth is the only planet known to us with resources for life to exist – air, water, food, and a habitable climate. It is home to nearly 7 billion people and millions of different plant and animal species. Our relationship with the planet is an essential partnership – we take care of the Earth and it takes care of us. Today, sustaining this partnership and the “just right” conditions for life is an increasingly difficult balancing act between human development and global change. For the first time, human demands on Earth’s resources – energy, land, and water - may be tipping life-sustaining processes out of balance. GISS and Columbia scientists are involved in the broad study of these global changes and the impacts on the habitability of the planet.